Today we are having sweet potatoes for breakfast. And I don’t mean sweet potato pancakes or sweet potato muffins with a teeny tiny bit of sweet potato puree stirred into them (although those are undeniably delicious). I mean an actual whole roasted sweet potato. Yes. That is what we are eating today. Are you ready to join me? Are you thinking that it’s strange to eat sweet potatoes for breakfast? I was a bit skeptical myself at first. But now I’m totally obsessed. Sweet potatoes for breakfast are AWESOME! They are warm, sweet, filling and make excellent vehicles for other breakfast staples like yogurt and fruit. For this particular recipe, I used coconut flavored yogurt, sliced bananas and cocoa nibs. It’s a pretty amazing combination that I know you’ll fall in love with. But you can certainly get creative if you’re feeling all fancy. Or use up whatever is in your refrigerator and pantry! To speed up your morning routine, you can roast the sweet potatoes the night before and then store them in your refrigerator until you’re ready to eat. Just briefly re-warm them before topping and serving. Easy peasy. Pre-heat your oven to 400 degrees. 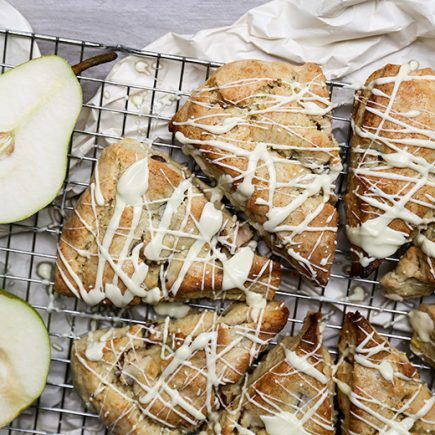 Line a baking sheet with aluminum foil and set aside. Wash the sweet potatoes and then cut them in half lengthwise. Rub the olive oil over all sides of the sweet potatoes. Place them cut-side down on the baking sheet and the roast them in your pre-heated oven for 25 minutes. Carefully remove the sweet potatoes from the oven and flip them over so the cut-side is now facing up. 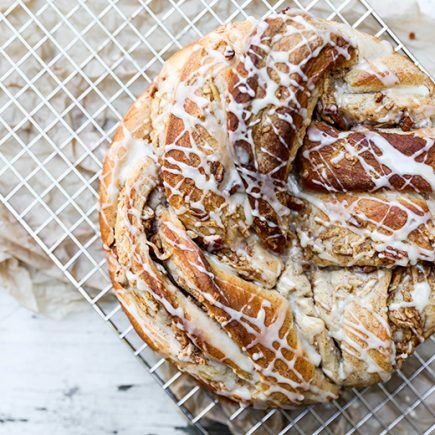 Drizzle with the honey and sprinkle with a few pinches of ground cinnamon. Place back in your oven and cook for 5-10 minutes more, until the sweet potatoes are easily pierced with a small knife. Remove from your oven and set aside. To serve, divide the yogurt evenly between the sweet potatoes. Top with the banana slices and a few cocoa nibs. Enjoy while still warm. 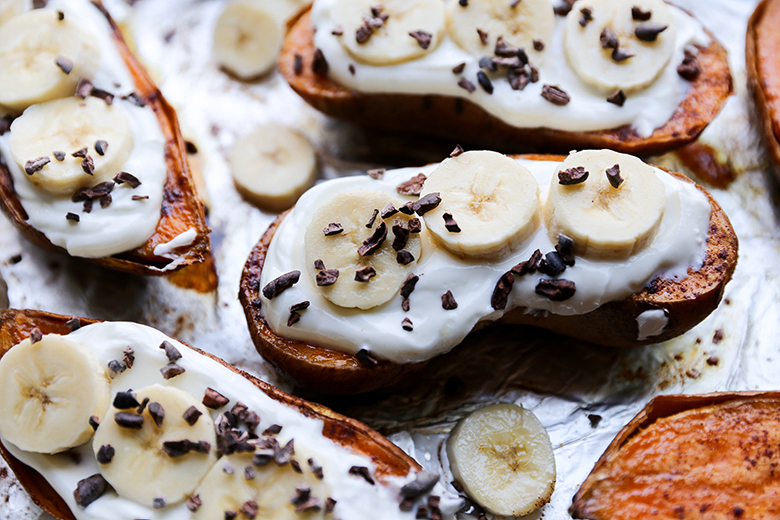 never thought of sweet potato for breakfast, but these look really interesting! Try it and let me know what you think! Thanks for stopping by, Laura! Such a great idea! Never thought to have sweet taters in the morning!! LOVE! Thanks, Lauren! They are so good for breakfast! I’ve been in such a breakfast rut! These sound perfect! With coconut yogurt?! YES! Thanks, Christina! These will definitely get you out of your rut! What a great idea! 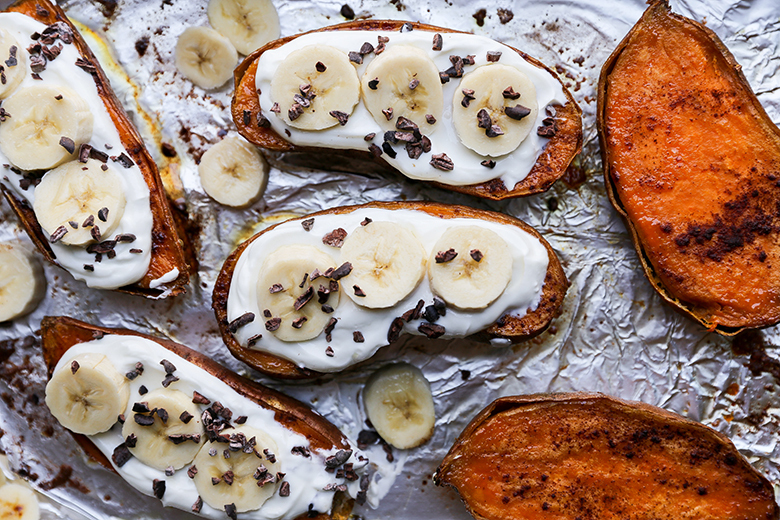 I love sweet potato no matter what time of the day and these boats look amazing! Thanks, Ashley! So good for breakfast or for a snack sometimes I’ll just have one half of the sweet potato. So good! Thanks, Zainab! Sweet potatoes are good all day, everyday! Let me know if you try it! This is such a fun breakfast, Liz! I would’ve never thought to eat a sweet potato first thing in the morning. I love how you jazzed it up! Thanks, Gayle! I hope you try it! Let me know if you do. 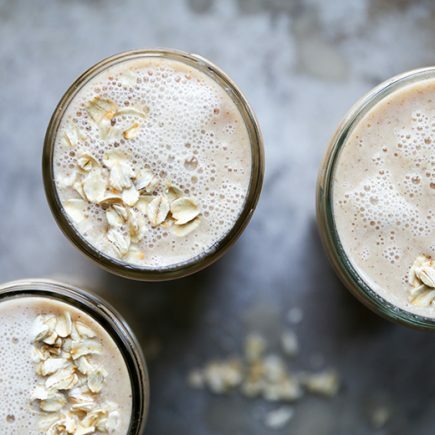 These are so fun and so much goodness to start the day, Liz! Thanks, Jennifer! It’s a great way to start the day! I love sweet potatoes, Liz, so I can totally see doing this! And I can’t believe I haven’t thought of it! Thanks, Marcie! I hope you try it out! Yummy! Sweet potato for sweet breakfast.. sounds and looks so good! It’s so good AND good for you! Try it and let me know what you think! Yeah! Try it and let me know how you like it! Hello from a fellow Seatllite! What a great idea…sweet potato boat? Genius! Can’t wait to try this 🙂 I’ll have to stop by Pikes Place and pick up a few sweet potatoes! Have you been to the greek yogurt stand in Pikes Place? The BEST. You should try it 🙂 Wish I could remember the name! Yes I know the place you are talking about! It’s amazing! Let me know how you like the sweet potatoes! Thanks for stopping by, Jennifer! LOVE the bright colors of this! I’ve made sweet potato hash before, but I’ve never thought of eating it like a boat! This is so clever!! I would have never thought of this but I love it! Thanks, Annie! I love sweet potatoes anytime of day! Thank you! That is wonderful! Happy Thanksgiving!